Hi, I recently bought a code 50,, but about 6 times now, while holding the save button to quick save a preset, after saving there is no sound from the amp, and I cannot change presets, or any other parameter. Turning the amp off ,then back on, and it starts working again. This is using the controls on the amp, not the gateway app. I checked the firmware about a week ago, and the program says I have the latest firmware. At my TSL100 I found the Serial-Number without any problems at the back, but I can´t find the number on my DSL40c. Can you tell me where it is? Thanks for your answer. I'm planning on buying a used Marshall Class 5, but it's one the first series (it has a little rattle). On different forums, I read that there is a replacement back called the KIT 00111. Are those still available? Where could I get one of those? I downloaded the windows program to upgrade my code50 to latest version...everytime i try to run the program it shows loading then disappears...nowhere on the screen...how do i use this to check for upgrades..im hoping that theres is a patch to fix the editing the preset names problem. seems when holding down the store button to get the left scroll if you hold it too long it goes to save...if not long enough nothing..sometimes you get it just right and get the left scroll screen.sometimes the amp locks up and it has to be turned off then on again to rebboot..and you have to redo..
Was Playing a gig llast night with my one year old JVM 205H when I went to the clean channel it was muddy/and the gain was all the way up not like my usual sound for that channel. Any Ideas? Tube Replacement? Any advice would be great. Can i use the code 25 as a cab. Is there a way to use the code 25 as a cab for something like a micro terror, hotone mini head or any other head? The main supply is set to 230 V 50HZ. I Live in Brazil, here the voltage has an frequency 60Hz. What should I do? After having played privately for 25 years on a Peavey Rage 158 The Code is overwhelming and I'm loving every minute of it. Really enjoying hearing a preset and having my head fill with songs that fit the sound. Its a brilliant idea and please keep refining it and updating it. Question 1: Has there been an actual firmware update yet? the software said my code is up to date out of the box so I just want to confirm my software is installed properly. Question 2: I would love to get a fixed date on the foot switch if you have one yet. Question 3: Is there a master way to get all the preset volumes to the same level or do I have to configure my favourite presets individually in order to get them to the same volume? Great job to you and the software company. On the code 50 there is an option to edit the presets but this is not on the 25. Is there still a way to edit presets? Can the usb be used for anything other than recording? Marshall CODE 50 Serial Number. I have recently purchased a Marshall CODE 50 and I want to register the amplifier online and for some reason I cannot find the Serial Number on the back of the Marshall CODE 50. I can find the Model Number: CODE50 but nothing indicating a Serial Number. Would you recommend using a high (250-300Ohm nominal) impedance Studio Headphone with Code50? Or should I go with a low impedance one? I have a Marshall valvestate 2000 AVT100 and suddenly the fx module stoped. The amplifier works like always "good" but the fx module is death. What can be the matter?? what my question is that if I haven't plugged in the power supply for the effect chain, i.e. the effect chain in the fx loop is dead as there are buffered bypass pedals inside. The fx loop is serial loop thus at this situation, the amp must be dead silent. But the reality is I still hear a low volume of my playing through the cabinet, this bleed through is normally happened in parallel loop, but why my hjs serial loop also do that? Is that normal as the circuit designed is like this or my jvm is defected? man, if it had a leslie or even vibrotone simulation it would be almost perfect!!! OK, so I followed the instructions I found in another answer here about uninstalling the updater and then downloading it and installing a newer version. 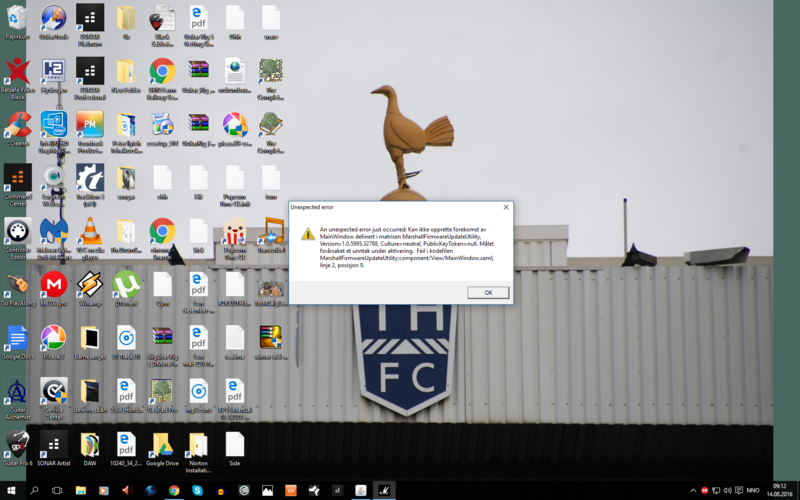 Now there's a new error that occurs preventing the updater from working. I attached the error. One of the things I looked forward to being able to do with this amp was to record without having to use my Line 6 Pod as a crutch. However, neither of the programs I normally use (Pro Tools and an older program called RiffWorks) recognize the amp via usb, and I've downloaded some trial software of a couple newer DAWs that recognize it but there's a horrible squealing noise that's produced on top of it (not to mention the guitar sounds like a poor copy of the amp--almost like it's a paper amp). I am hoping the updater will fix these issues once the updater works. My amp is rated 230v 50hz can i run it on 220v 50hz ? 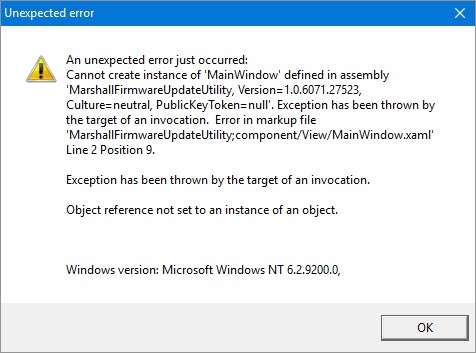 i redownloaded the utility update set up.exe (it did seem that a new version was put out, but i still get the same error, ive attached a screen shot too. though it is in norwegian sorry bout that. also should my code be cooenced to the usb when running the programme? Hi, I am trying to register this product on your website but it keeps telling me there is no model number. How do I actually register a stanmore speaker?